If you’re ready to move away from the typical deck design for your backyard, look no further than Mountain Laurel Handrail, works of art for your decks, balconies, and stairs. Give your deck an upgrade or a facelift, and then kick back and relax with your beautiful new view. 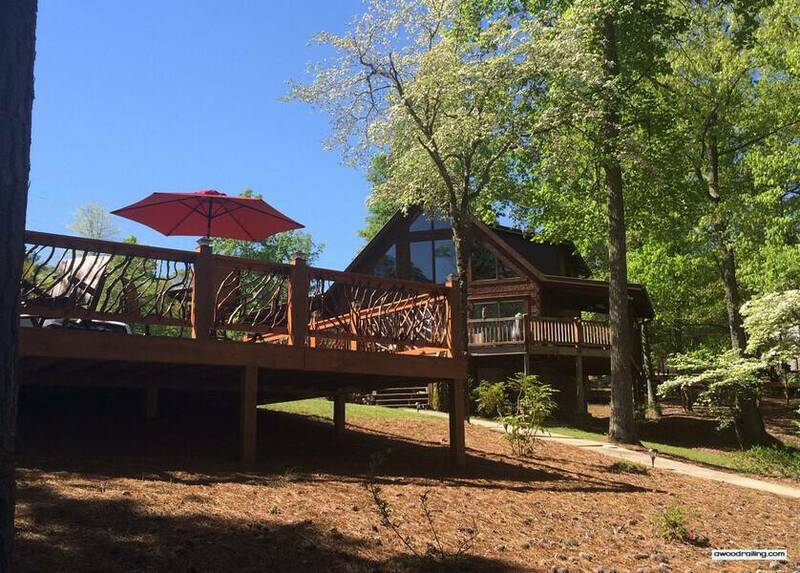 Mountain Laurel Handrails recently installed a new deck for this beautiful lake home in Alabama. The homeowner was thrilled with the new railings, and even provided photographs of the finished deck. 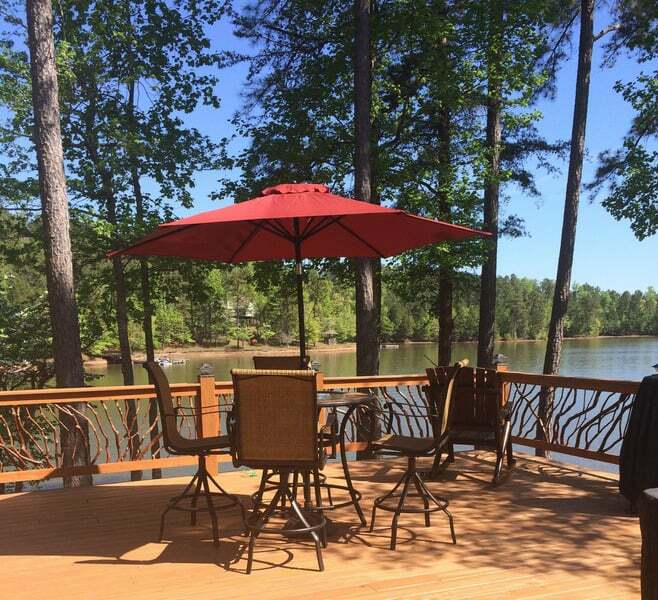 This brand new sturdy deck overlooks a beautiful lake. Mountain Laurel Handrails also installed beautifully finished rails with natural branch detailing around the deck. Hi – the rails turned out great. I’m trying to talk my husband into replacing all the railing around the house. He said no but I’m still working on him. I’ve attached lots of pictures. Thanks again we love them! Mountain Laurel Handrail creates custom works of art for decks, balconies, and stairs. These art works are available for order nationwide and are also easy to install in separate sections. One of their recent works is a deck railing for an Alabama lake home. The handrails are made of all wood with straight top rails and straight lengths of wood all around. In the middle is a consistent and unbroken branch style design. The different angles along with varied widths of the branches create an artistic, yet at the same time, realistic design to these rails. The rails have natural finishing that matches the finish on the owner’s already finished deck. As you can see from the photographs, some of the natural branch detailing overlaps and intertwines, lending to a more natural, woodsy look to the deck. This natural branch detailing is a fantastic way to move away from more traditional deck railing, and really gives this particular deck a lot of personality. This intricate detail would be perfect for a vacation home in the woods, or on a lake such as this one, but it would also work well for a deck located in a more urban setting if you were looking to incorporate a more rustic look into your living area. The new railings make the deck look like an extension of the trees surrounding the lake instead of an intrusion into the peaceful lake environment. These handrails are a true work of art with how they cohesively blend while still providing a safety railing between the deck and the lake that gives an authentic cabin feel. The deck handrails themselves were handmade using unique sticks and branches each designed to be different and yet intertwined together leaving each set of railing a one of a kind beauty. When the sun hits the deck just right the railings create lovely shadows on the floor of the deck. In addition to their visual appeal these railings also work to keep young children and pets safely on the deck and away from the lake. The homeowners will be enjoying their new deck and rails while checking out the beautiful view of the lake. Replacing your existing deck and rails is a terrific idea for updating and upgrading your property. 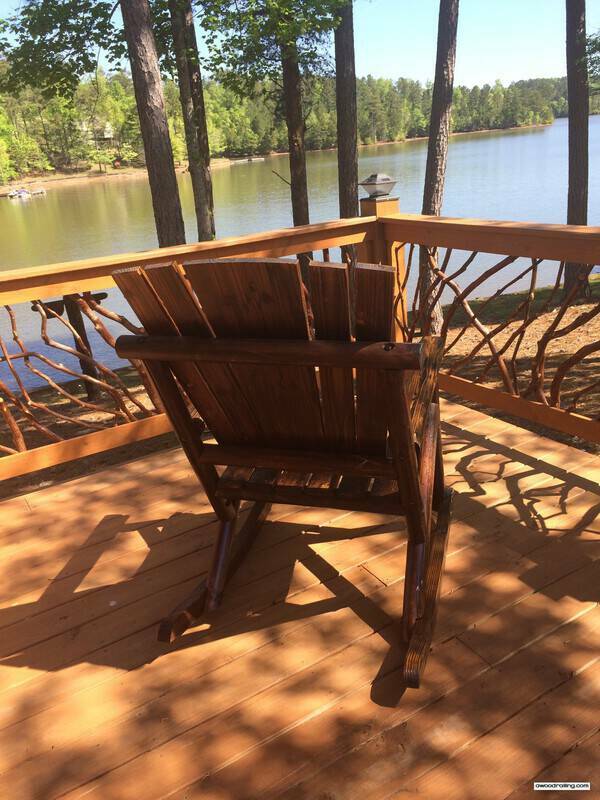 These deck railings are available in Alabama and also nationwide. And the sections are easy to install! The rails go great with all kinds of furniture, especially wooden furniture. The deck overlooking the lake is made even more with nature matching rails that create an earthy theme to this deck. 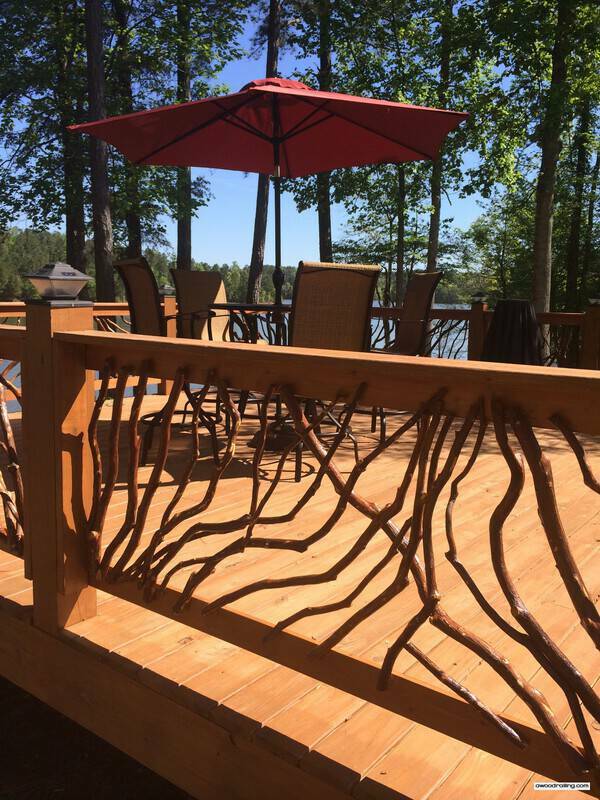 With a creative design of branches for the deck balusters, the deck truly becomes a part of nature that surrounds it. Mountain Laurel Handrails prove just as stunning and practical when used on free-standing buildings. 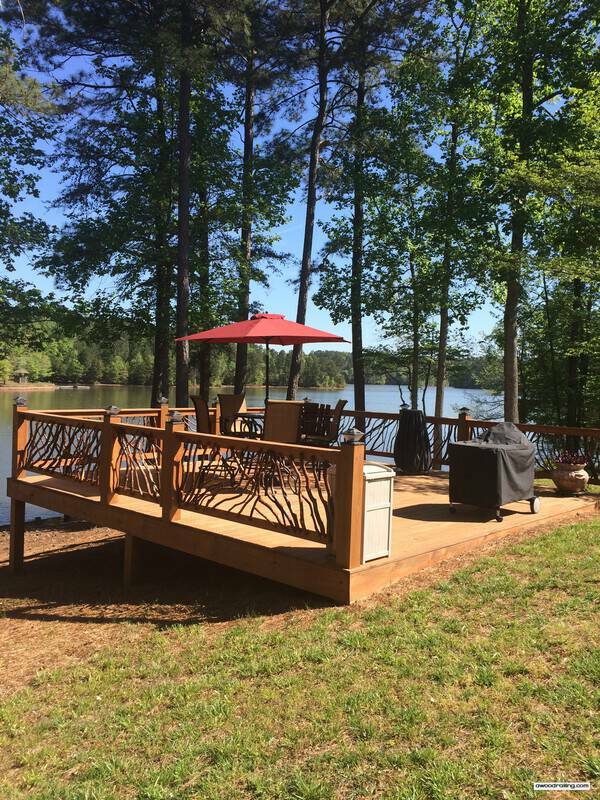 They provide lake decks with a stunning finish that cause the decks to have a natural look as if the deck was meant to be overlooking the lack a look that metal and plastic rails are unable to match up to.